Access to primary sources is essential for researchers, but effective online access requires a range of support extending beyond traditional methods. Catalog records and finding guides are still necessary, but search engine optimization (SEO) is also required to create effective, full access to online collections. Dan Reboussin, Head of the University of Florida (UF) Libraries’ African Studies Collections, has received the 2012 CRL Primary Source Award for Access for his efforts to create effective access to the Jean-Marie Derscheid Collection. Handwritten note on events occurring in 1610, Kitara, Buganda. Courtesy of the Jean-Marie Derscheid Collection, University of Florida. The Derscheid collection encompasses a rich set of manuscripts relating to pre-colonial and colonial-era Burundi, Eastern Congo, and Rwanda. These unique and rare materials document the history of the region. They were created and collected by Jean-Marie Derscheid, a zoologist and conservationist who undertook historical research on Rwanda and the Eastern Congo from 1924 to 1939. He criticized Belgian colonial agricultural policies promoting cultivation in the Virunga Mountains, one of only two limited habitats of the endangered mountain gorillas. René Lemarchand, UF professor emeritus of political science and author of Rwanda and Burundi (1970), states that Derscheid’s scholar-curated collection of primary research materials is a critically important resource for interdisciplinary research in this area. Reboussin worked closely with author Lemarchand to enhance access to and preserve the microfilm collection. He ensured long-term scholarly access to the materials by securing permission from Derscheid’s heir to distribute the collection and by creating a complete, verified, item-level index. This year, Reboussin led a project to digitize the Derscheid manuscript collection to ensure ongoing access. Building on prior work with the catalog record and index, Reboussin set out to ensure this rich collection was fully accessible by developing several innovative, enhanced means to support online access. The project began with the digitization of the Derscheid collection from microfilm and the creation of complete, item-level metadata using the existing index. 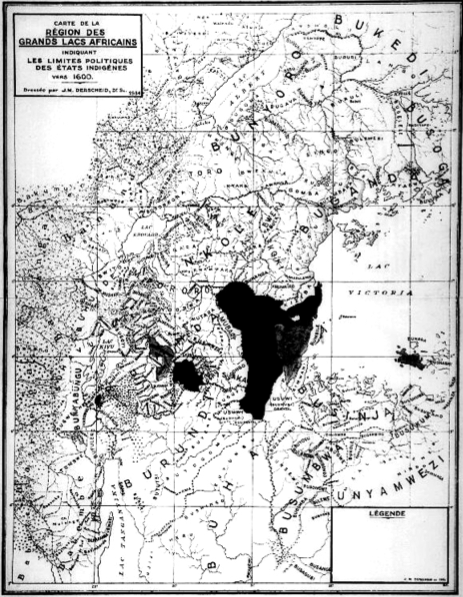 Map depicting 17th-century ethnic group distributions in present-day Rwanda and Eastern Congo. Courtesy of the Jean-Marie Derscheid Collection, University of Florida. Creating the specialized Derscheid digital collection within the UFDC (powered by the SobekCM software engine, optimized to allow Google and other search engines to easily access and automatically index or “crawl” included materials). The creation of a separate collection frames the research materials, providing enhanced access to the critical support materials and ensuring complete, integrated access to the entire collection.